Next review No Sale of Omega XL Here! 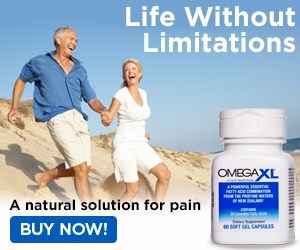 Sep 01, 2015 OmegaXL has hundreds of thousands of satisfied customers who purchase our product every month due to its proven ability to relieve joint pain due to inflammation. We strive for 100% customer satisfaction, we offer a Money Back Guarantee for the first 90 days following the initial order and we process refunds promptly. We are disappointed when customers rely on negative, mostly anonymous internet postings rather than the many positive customer reviews and testimonials. If you would like to learn more about OmegaXL’s benefits, our 90 Day Money Back Guarantee or our return policy, please contact our Customer Advocacy Group at 1-800-607-0419 or via email at cagsupport@greathealthworks.com. Planned on ordering the product but after reading all of the complaints I stopped. Thanks for saving me time, money and grief. 100 word minimum? Not much to say other than I was hoping the product and company were good but obviously both are lacking. If anyone out there know of products that work and are backed by a company that can be trusted please let me know. At this point I am just trying to meet the 100 word minimum and I am glad I am not looking into catheters or diapers or some thing along these lines. I have enough problems just moving my joints if you know what I mean. Review #630889 is a subjective opinion of User630889. Thank you all, you have saved me the trouble that you all are experiencing, I was going to order but have changed my mind. Poor poor customer service i order 1 order they charge me for two in my account i try to call in cancel i was on the phone for 38 mins after calling so many time when i finally talk to someone Josh he told me it was mail out already i will have to send it back it will take 30 days for the money to go back into your account, in they will keep $9.95 for shipping and handling so either way they still gonna make money off of you PEOPLE BE CAEEFUL OF THESE SCAMS!!! !